⦿ Relaxation stage or diastole. Systole is the contraction phase of the cardiac cycle. The systole contains of two events called Atrial Systole and Ventricular Systole. The BP of 120 is considered normal in case of systolic pressure. Diastole is the relaxation phase of the cardiac cycle. The Diastole consists of two events called Atrial Diastole and Ventricular Diastole. The BP of 80 is considered normal in case of diastolic pressure. Systole is the contraction phase of the cardiac cycle of the heart. 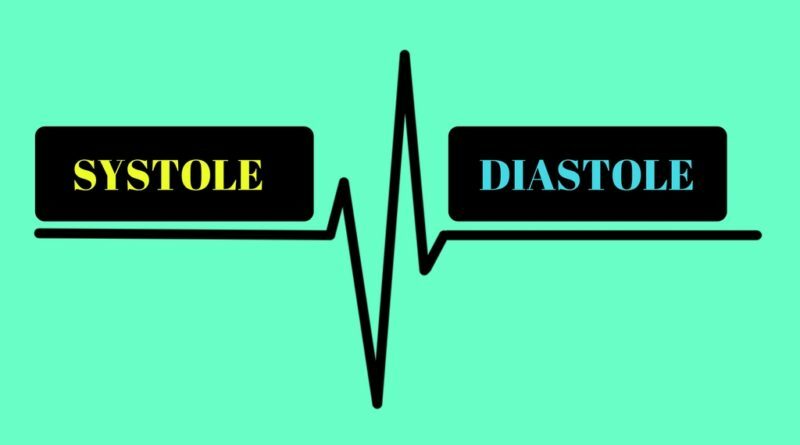 Diastole is the relaxation phase of the cardiac cycle of the heart. In systole stage, when the heart contracts, it pumps blood from the heart Chambers into the aorta and a pulmonary artery. In Diastole stage, when the heart relaxes, it allows the heart chambers to be filled with blood from venacava and pulmonary veins. The blood pressure of the systole stage is high. The blood pressure of the diastolic stage is low. The systolic pressure for a normal person is 120. The diastolic pressure for a normal person is 80. The systolic pressure undergoes considerable fluctuations at different conditions like the extent of work done by heart, the force at which the heart is working, etc. The diastolic pressure undergoes much less fluctuation in health and remains within a limited range. The increase in diastolic pressure indicates that the heart is approaching towards failure.